The 16th C Ottoman gate is located on the western side of the old city wall. Psalms 122:2 : "Our feet shall stand within thy gates, O Jerusalem." The Jaffa Gate is a 16th C Ottoman gate which is located on the western side of the old city (facing the direction of Jaffa). It is the main entrance from the western section to the eastern (old city section). The walls in this area were first built by the Hasmonean kings in the 2nd C BC in the highest point in the old city (773M). This construction was in order to strengthen the new expanded western side, the "upper city", which had no natural defenses -unlike the valley of Kidron on the east side. The site was located in the north-western corner of the Hasmonean defense walls. 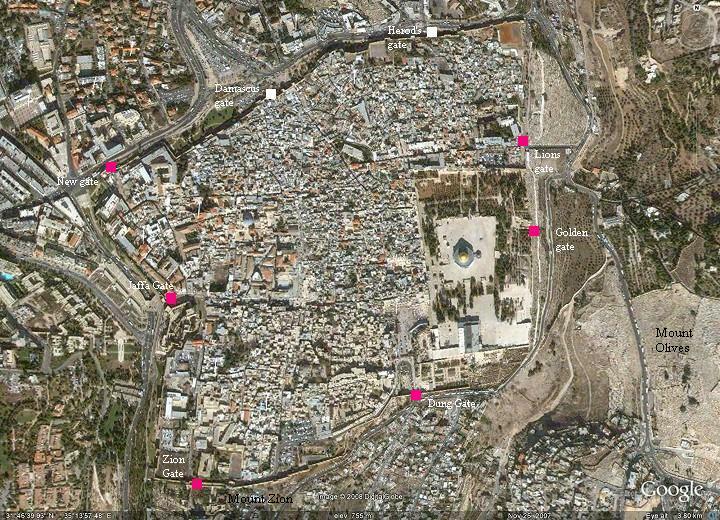 Herod the Great, the great builder of Jerusalem and Israel, added here 3 mighty towers (37-34BC). For a detailed description, see David's tower. After the fall of Jerusalem (70AD) the site was a Roman camp. During the Arab conquest (638AD) a fortress was built, and later was conquered (1099) and then rebuilt by the Crusaders. 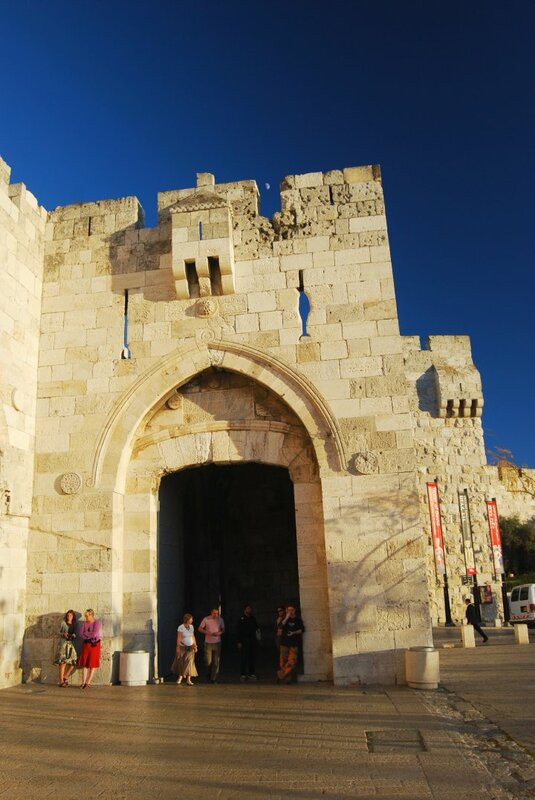 The Crusaders built a gate behind the present location and called it David's gate. Saladin captured the city in 1187, and the gates and walls were later destroyed by Al-Mu'azzam, the Ayyubid Sultan of Damascus, during the fifth crusade (1219). The Mamlukes replace the Ayyubids in 1250 but leave the walls leveled in fear of a Crusader re-conquest. The Ottoman Turks gain the city in 1517 and control it for 400 years. The walls were rebuilt again (1537-1541) during this period. The gate, among other structures, was built by the great builder of Jerusalem, the Ottoman Sultan Suleiman the Magnificent (ruled 1520-1566). 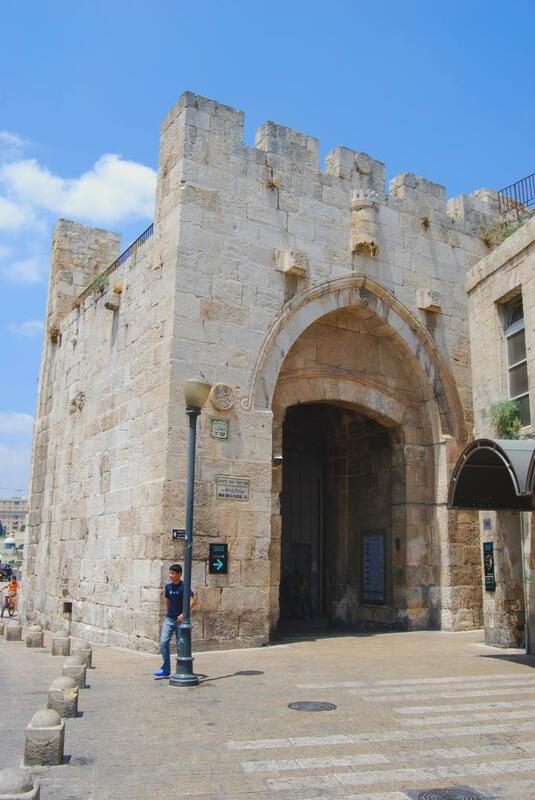 There were few houses outside the walls at this time until the mid 19th C. The door of the gate, made of iron plated wood, was closed every night and protected the residents of Jerusalem. Until 1898 there was a low wall and a defense moat between Jaffa gate and the city walls, on its south side. The entrance was only through the double gate at the left side. During the visit of Kaiser Wilhelm II in 1898 this wall on the south side of the gate was opened so that the Kaiser could process into the old city on horseback with raised banners. The wider entrance is now used for vehicle access. In 1909 the Ottomans constructed a tall clock tower behind the gate, dedicated to the Sultan's 50 year anniversary. The victorious British army arrived in 1917, and on Dec 11 1917 General Allenby entered on foot through the gate, observing the holiness of the city. The clock tower was dismantled in 1921 in order to resume the ancient theme of the walls. In 1948 the Israeli forces attempted to enter the old city through the gate. Scars of bullets holes can be seen on the walls. 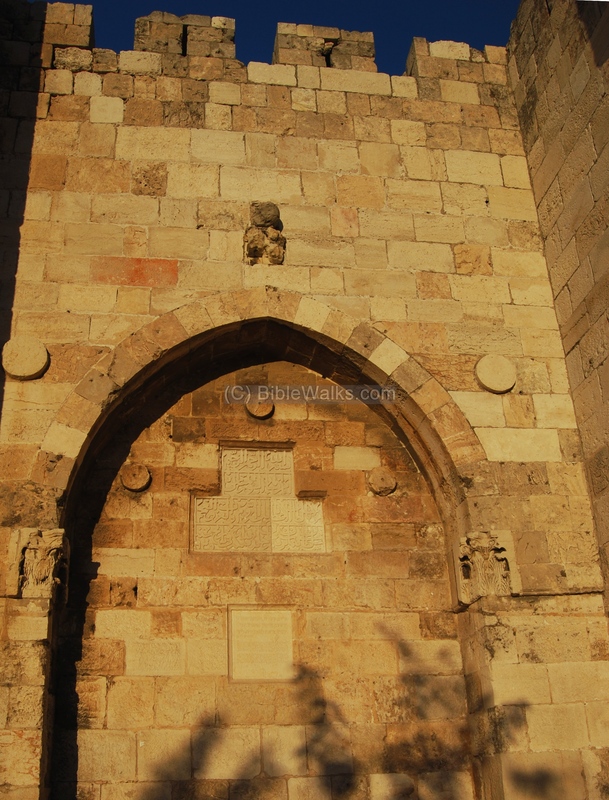 The old city was evacuated for 20 years, and the gate was sealed during the Jordanian control. In 1967 the gate was opened again and the city reunited. A road was constructed on the south side of the gate, and is today the major vehicle entry point to the old city. 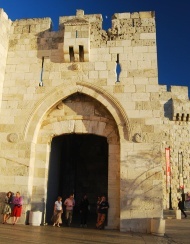 Jaffa Gate is located on the north side of the walls of "Tower of David". This is the main entrance to the old city, from west to east. Jaffa road, one of the central streets in the new western section, starts from the gate and used to be the principal road to Jaffa, hence the name. 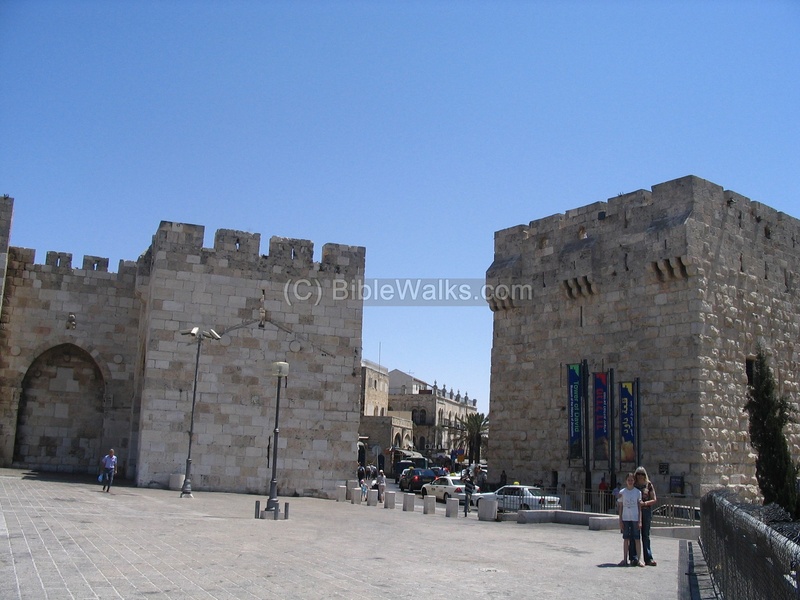 On the right side is the walls of the Tower of David complex. 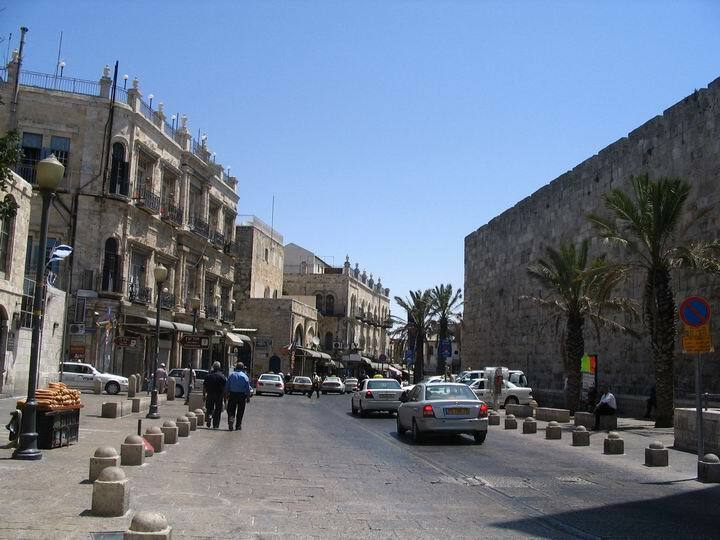 The photo below shows a view of the Jaffa gate from the north side. The gate was built in 1538, as part of the Ottoman wall construction. A stone plate above the gate, seen just above the opening, tells about the builder and dates the gate. A closer view of the north entrance is seen below, where the pedestrians enter to the old city. Behind the gate is the vehicle entrance to the old city. Notice the moon above the rightmost gap in the wall. Around this gap are numerous scars of bullet holes. They were inflicted as the result of heavy fighting around the gate during the 1948 Independence war, after attempts to enter through the gate. An Arabic inscription is embedded above the gate, as seen on the right. It writes about the builder, the Ottoman Sultan Suleiman the Magnificent, and specifies the date of its construction (1538-9). 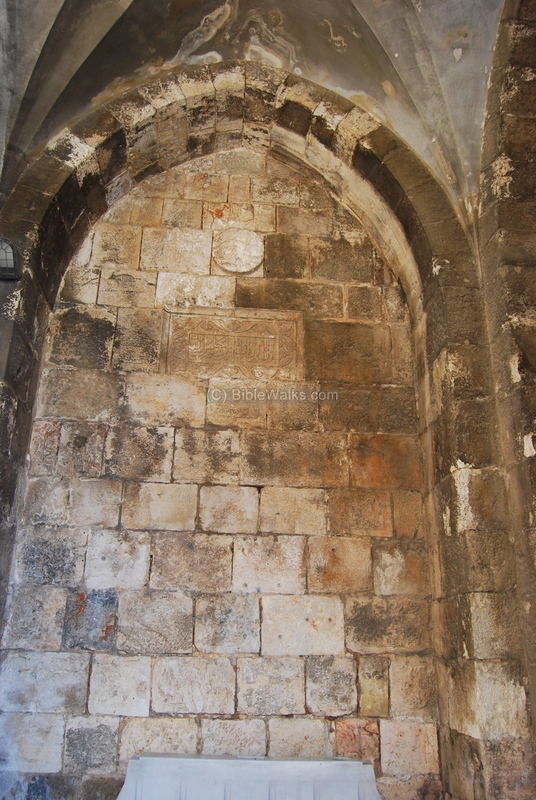 The niche on the left side of the gate has two additional inscriptions - an Ottoman inscription from the date of the construction, and a modern plate of the repairs. 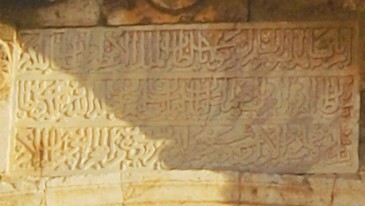 A closer view of the Arabic inscription inside this niche. 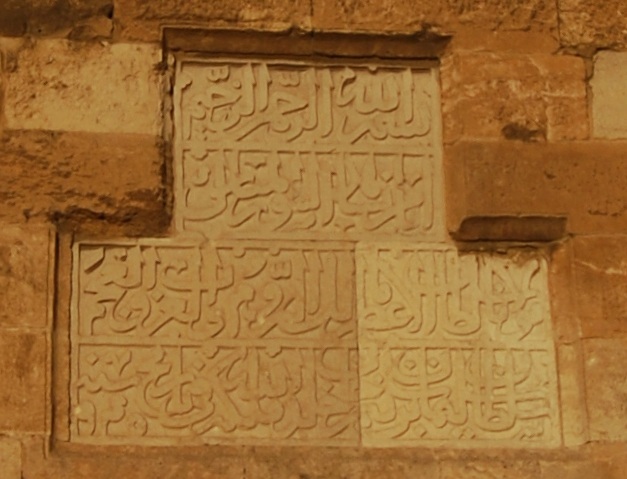 This inscription praises Allah his loved Abraham. The reason it is dedicated to Abraham is since the road from this gate leads also southwards to Hebron, the city of the Patriarch. After passing the door, there is a sharp left turn. This was designed as a defensive measure, intended to slow down the entrance. The wall facing the entrance is shown below, with another inscription. The rear of the gate is seen below. Behind the gate is the city within the walls, and David Street which leads to the temple mount (straight on) and the Church of the Holy Sepulcher (left turn on next street). Bab Mihrab Daud - another Arabic name of the gate - named after David. Mihrab - prayer niche. Daud - David. King David is regarded by Islam as a prophet. Forte David - Crusaders' name of the gate.